This past January, I got my biggest, and perhaps most special, tattoo. 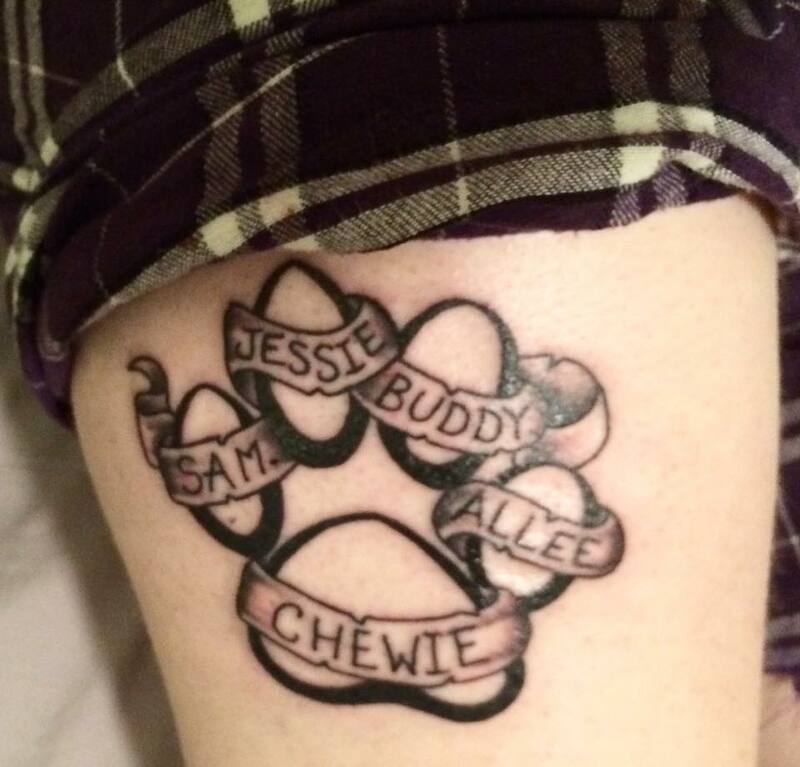 It’s a giant paw print covering the outside of my right thigh, with the names of all the dogs I’ve had in my life. 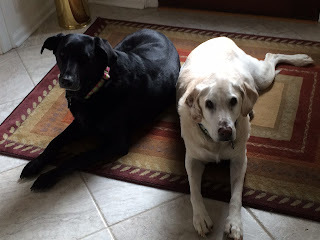 I’d been planning to get some kind of tribute to my dogs at some point, but when Buddy, my family’s 12-year-old yellow lab, suddenly died of old age and health complications in January, it reminded me that there’s no time like the present. Especially when it comes to dogs. Just like my tattoo, this post is a tribute to all of my dogs. My tattoo is for Sam, who my mom and I adopted in 1996. My love for Sam is what inspired me to learn to write, so that I could write stories about him. Sam had been abused in his previous home, and was left with a fear of men. 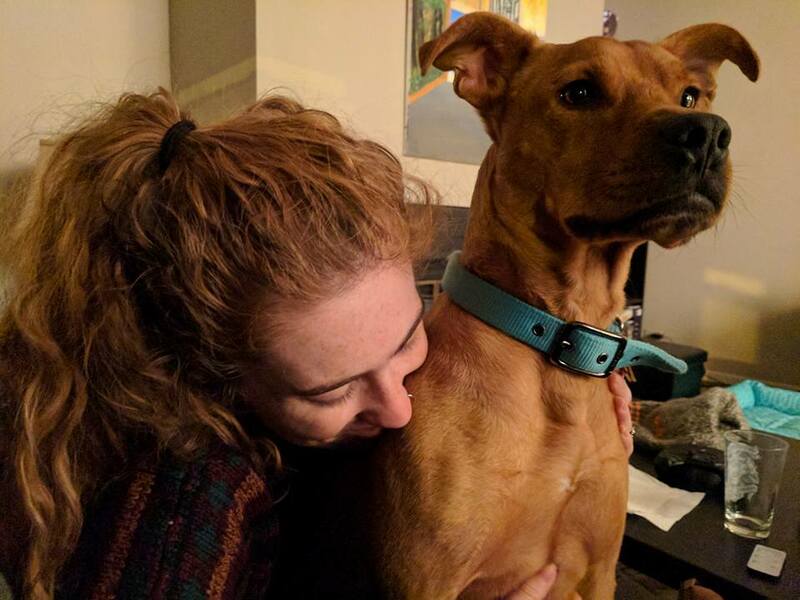 So, at the time, he was the perfect dog for a single mom and her four-year-old daughter. Sam was the perfect man of the house. And when my mom eventually did marry my dad four years later, Sam got over his fear of men just so he could learn to love my dad. What a guy! After Sam died in early 2008, I wrote an essay as a tribute to him, about how he inspired me to write. 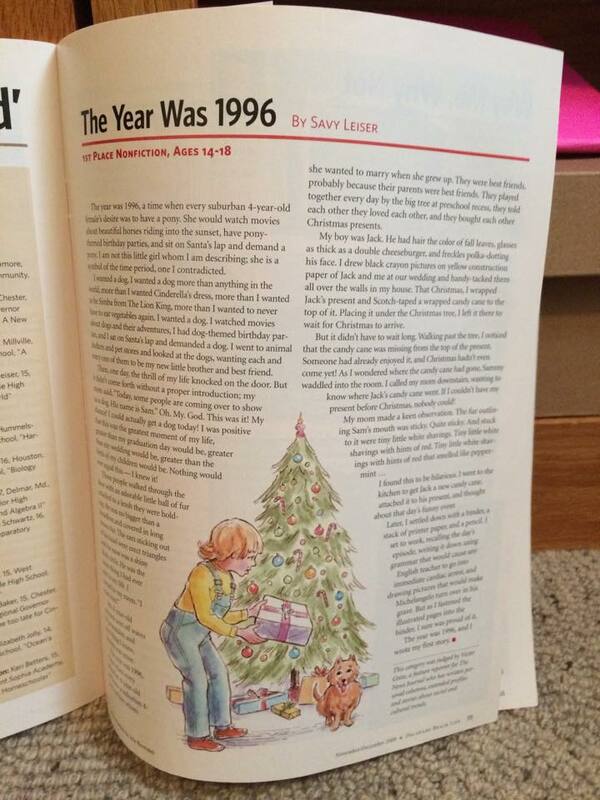 I ended up getting that essay published in Delaware Beach Life’s Fall 2008 issue, when I was 16. 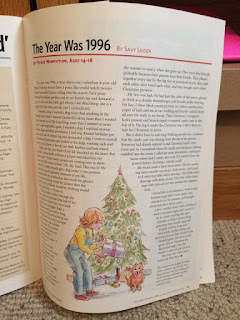 So, not only did Sam inspire me to learn to write, but he was also the subject one of my first ever published pieces. My tattoo is for Jessie, the first dog we got as a puppy. In 2001, shortly after my parents got married, I went with my mom, dad, and brother to pick up Jessie, our sweet yellow lab puppy. Jessie had the sweetest little eyes, but we couldn’t let them fool us; she could be a little monster when she wanted to. (An adorable monster, but still.) Jessie once ate a patch of drywall out of the laundry room. She just ate the wall. How did she even do that? My tattoo is for Buddy, our second yellow lab. In 2004, our family was devastated when Jessie suddenly died of leukemia at the age of three. 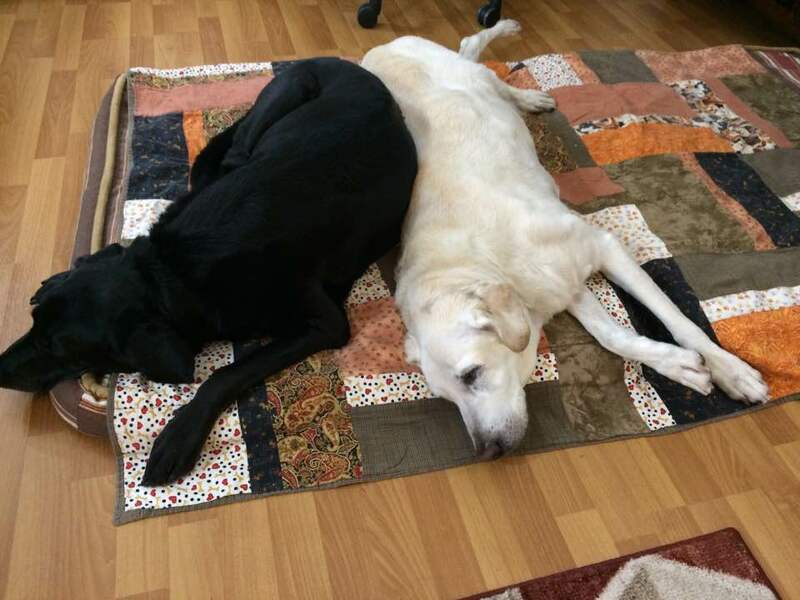 Sam was devastated, too; he was used to having a little sister around. We soon learned of a puppy named Buddy, whose owner was going through a difficult divorce and no longer able to care for him. So we adopted Buddy from him. As a puppy, Buddy was the craziest dog we’d ever seen. You know those scenes in the first half of Marley and Me, when Marley destroys the house? Buddy made Marley look like an angel. My tattoo is for Allee, our little princess. If you’ve been following this blog, you may recognize Allee as one of the characters from the Furever Home Friends series. When Allee was born, she, along with the rest of the litter, was abandoned in the woods by someone who didn’t want her. In early 2007, we found Allee at an animal shelter, and instantly fell in love with her. Since Allee grew up with two brothers, Buddy and Sam, to play with, she easily got out her energy, and never had any behavioral issues. But that also meant that Allee loved to DEMAND attention. If we’d ever give Buddy more attention than her, Allee would start WAILING. It was pretty funny, actually. Since Buddy died this past January, Allee has been super sad. She’s still her sweet, attention-demanding self, but it’s obvious that she misses her big brother. Allee lives with my parents, who are only a 30-minute el train ride from me, so I see her most weekends! And, finally, my tattoo is for Chewie. My baby. 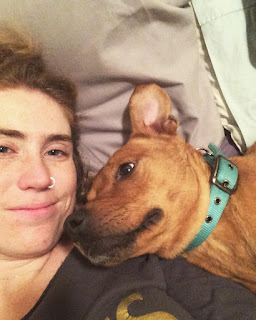 Tyler and I adopted Chewie together this past September, and we can no longer remember what life was like before him. Like Sam and Allee, Chewie had suffered abuse as a puppy, and was rehabilitated at a shelter. When we went looking for a dog, as soon as we walked into ALIVE Rescue on Belmont, Chewie greeted us at the door. He looked so excited to see us, even though we’d just met, and we instantly fell in love with him. Chewie’s everything. He demands attention pretty much 24/7 (and gets REALLY sad when we have to go to work), but gives us insane amounts of love in return. Chewie has his own Instagram account, @ThisCharmingChewie, as well as his own Facebook. Chewie’s active on social media so he can stay in touch with all his friends! He’s a super popular guy.